We hired a professional videographer to shoot this seminar at Charlottesville, West Virginia. It comprises 12 segments, ranging from 14-30 minutes, so you could watch one or two segments at a time and complete the series in a week, if you so desire. It is also a great choice for home fellowships. Free seminar study notes are available in PDF format from a link on the footer of any page of our site. Learn what God did for us on that wonderful day when we first accepted the Lord Jesus Christ as our Savior. What was the result of our faith in Christ? What is our identity? What kind of help do we have along life’s way? The seminar is now available in a 128-page paperback with additional chapters and a complete concordance of the usages of “in Christ” and “Christ in” in their various formats. Get your copy direct from www.PeterWade.com or from other online retailers. Based on Romans 6:11, “Likewise, you also, reckon yourselves to be dead indeed to sin, but alive to God in Christ Jesus our Lord” (NKJV). 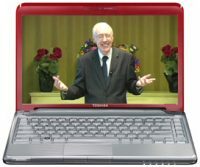 This seminar by Peter Wade was recorded at a Family Camp in Halls Gap, Victoria, Australia. It comprise 8 sessions, ranging from 24-28 minutes.It is a journey through Romans chapters 6 to 8 and will help you discover the background to Christ’s death and resurrection on your behalf, and how to walk on this truth. Learn to win the battle for your mind and be sensitive to Christ within. Understand how you are dead and yet still standing! Deal with the sin problem once and for all. This is Peter Wade at his best, sharing with great insight, humor, and practicality the truths of Romans chapters 6 to 8, as well as chapter 5:12-25. You will learn the four key words that unlock this whole section, simple yet so profound that it could change your life. The seminar is also available in a 112-page paperback. Get your copy direct from www.PeterWade.com or from other online retailers.